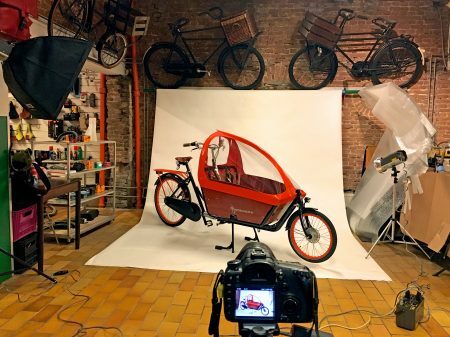 This is WorkCycles’ improvised “photo studio” and a good example of how things look behind the scenes here. We’re a small and flexible firm, and everybody who works here (all seven of us!) has to wear various hats. I’m the director but can sometimes be found in the workshop wrenching bikes though more often I’m “testing products” by riding around the city with kids and cargo. Everybody here is obsessed with bikes and cycling. We get around town by bike, obsessively design bikes, tour on bikes, race bikes, collect old bikes, build cool bikes, Facebook and blog about bikes. Our love of all things bicycle led WorkCycles to spread its efforts over a broad range of activities, far too broad really. Of course we design, build and sell WorkCycles bikes both via our dealers and directly to customers worldwide. But also we’ve… run two (well-loved) shops, rented bikes and bakfietsen (cargo bikes), repaired most any bike or trike that rolled into our shops, sold Frog kids bikes, Micro run-bikes and scooters, kids helmets and all sorts of accessories. Parts for Dutch (cargo) bikes are difficult to find elsewhere so we’ve been shipping them to customers worldwide. Then there’s also the weird stuff like building special heavy-duty wheels for most of the bicycle taxi firms in Amsterdam, repairing nice old ladies’ old E-bikes that nobody else dares to touch, or building special touring bikes for a family that cycled around the world with kids 8, 9, and 10 all on their own bicycles. Slowly over the past couple years we’ve been focussing our efforts. First we stopped renting bikes and bakfietsen. Of course we still have a small fleet of demo WorkCycles for customers to borrow and test for a few days. Gone is the time and attention consumed by setting up groups of tourists with bikes, getting calls that they lost the keys, got a flat tire, students bickering about the prices, whatever. It was fun when there were just a half dozen bike rental shops in Amsterdam and those who rented bikes tended to be interested in cycling. Now there are hundreds of bike rental places here (even the cigar shop around the corner!) and riding a bike in Amsterdam is just a must-do item on every tourist’s bucket list. In 2015 we closed our Veemarkt shop in Amsterdam Oost. We’d been considering this step for several years but it was where I started WorkCycles in 2003 so I couldn’t let go of it. Eventually there was just no escaping the fact that our sales were increasingly outside the Netherlands both via the dealers and end-user direct. Currently more than 75% of WorkCycles’ bikes leave the country so running multiple shops in Amsterdam made no sense, neither economically nor organizationally. It was just unfortunate to leave our many customers in the eastern part of Amsterdam without a good local shop for maintenance. More recently we’ve been turning away most non-WorkCycles bikes from our workshop. There’s less delay for our regular customers and we can maintain a better stock of the parts needed for our own bikes, instead of for every bike in the city. Maintaining WorkCycles bikes is of course also much more predictable for us which enables the workshop to plan more accurately, making everybody happier. The more we focus the more smoothly our business runs. Each time we forecast that the turnover will suffer but the cost reduction should compensate. In fact the turnover invariably remains constant or even increases. Why? Probably because we have more time and attention to focus on our core business activities. What’s next? Big changes are ahead but I’ll let you extrapolate and guess for now. There are a few more minor activities to trim away but we’re also going to make some fairly serious changes to how we do business both locally and abroad. Keep posted for more news. This entry was posted on Monday, November 28th, 2016 at 17:09	and is filed under About WorkCycles, Uncategorized. You can follow any responses to this entry through the RSS 2.0 feed.You can skip to the end and leave a response. Pinging is currently not allowed.